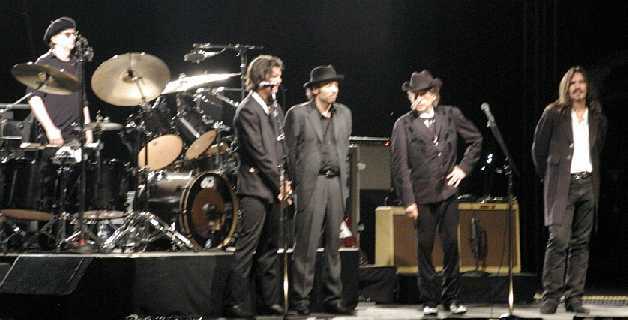 Bob first sang "THIS WORLD CAN'T STAND LONG" during his last concert of 1999, on November 20th, before the winter break which lasted until March 10th 2000. The second version ever, which Bob performed during his first concert in 2000 in Anaheim, is absolutely stunning. Each warning message of the three verses is underlined by a most powerful 15-seconds-harmonica-solo. The other Anaheim version has some very nice harmonica as well. I have been told, that both versions were performed without his guitar. Listening to these performances one is left with the impression that Bob Dylan is deeply convinced of the message he tries to convey with this song. He does tell us in this song that "it's not dark yet, but it's getting there" and that "a hard rain's a-gonna fall" on this world "too full of sin" which "get's more wicked every day". So "be ready, don't wait too late", for one day "they close the door". But he also is confident that the same hand that led him through seas most severe will kindly assist him home. This hand of God, with which he will take you by the hand and lead you beyond the burning sand, is the same nail-scarred hand Bob Dylan is pointing out when performing "I AM THE MAN THOMAS". "THIS WORLD CAN'T STAND LONG" had been performed outside the US only once (Toronto, Canada) until September 2000, when my wife and I were among those lucky ones who witnessed the first and so far only performance of this song in Europe (Glasgow, Scotland). Like he did on March 10th 2000, Bob on February 25th 2001 chose again to include "THIS WORLD CAN'T STAND LONG" in his first setlist of the year (for the first time since Glasgow closing his acoustic set with any other song than "SEARCHING FOR A SOLDIER'S GRAVE"). It was not to be the only time he would sing this grave warning to the Japanese, as Bob repeated it in the next two shows, all the more powerful in connection with "TRYIN' TO GET TO HEAVEN" in the same set. The first US-performance of "THIS WORLD CAN'T STAND LONG" since June 2000 was on May 4th 2001, at the Music Midtown Festival in Atlanta, where it was followed by "DOWN IN THE FLOOD". I would call this a most thought provoking juxtaposition: "This world has been destroyed before because it was too full of sin, for that very reason it's going to be destroyed again. .... Be ready don't wait too late. .... If you go down in the flood it's gonna be your own fault .... It's gonna be the meanest flood that anybody's seen." In the following two days Bob chose to repeat this powerful combination during his set at two more festivals, in Nashville and in Memphis. It was not performed in Europe in 2001, but in August in Sedalia "THIS WORLD CAN'T STAND LONG" was followed again by "DOWN IN THE FLOOD", as it had been in May. Ten days later another audience in Telluride was presented with this challenging song. 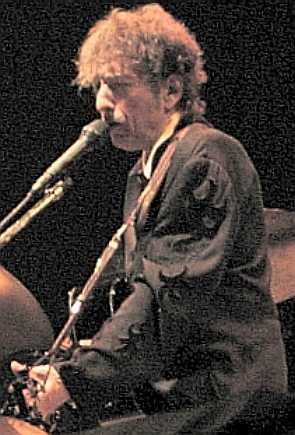 Halfway through his fall 2001 tour, in Madison, Bob chose to sing this song for the first time directly following "A HARD RAIN'S A-GONNA FALL". Three days later Bob performed "THIS WORLD CAN'T STAND LONG" for a second time in Nashville (where he sang it already half a year earlier). Another three days later it appeared in Grand Rapids, for the first time in the same setlist as the rare "EVERY GRAIN OF SAND". Two days later it was performed for the second time in Toronto, thus appearing in the only Canadian setlist of both 2000 and 2001. The next performance of this song three days later in Pennsylvania was already the fifth one in nine consecutive shows. The next appearance of "THIS WORLD CAN'T STAND LONG" was nine days later in Connecticut (exactly two years after its first performance), and three days after that in Maine this song appeared in the same setlist as "HALLELUJAH I'M READY TO GO" and "NOT DARK YET". The first performance of "THIS WORLD CAN'T STAND LONG" in 2002 was in West Virginia in February, once more in the same setlist as "A HARD RAIN'S A-GONNA FALL"; the second performance was two days later, in South Carolina; the third one two days after that, in Georgia, again in the same setlist as "A HARD RAIN'S A-GONNA FALL". Then it was not performed for more than half a year until August, when "THIS WORLD CAN'T STAND LONG" had its third ever Canadian appearance, in Winnipeg. During the next show, in Saskatoon, Bob performed it again, followed by "SOLID ROCK", telling that particular Canadian audience: "... this world can't stand ... but I'm hanging on to a Solid Rock made before the foundation of the world ...". Two days later "THIS WORLD CAN'T STAND LONG" was performed in Calgary; and then on the final show of that summer tour in Aspen. Scoffers will come in the last days with scoffing, following their own sinful desires. They will say, �Where is the promise of his coming? For ever since the fathers fell asleep, all things are continuing as they were from the beginning of creation.� For they deliberately overlook this fact, that the heavens existed long ago, and the earth was formed out of water and through water by the word of God, and that by means of these the world that then existed was deluged with water and perished. But by the same word the heavens and earth that now exist are stored up for fire, being kept until the day of judgment and destruction of the ungodly.